Yes, they would! Y'mean you haven't made any yet?! I haven't, but I think I need to. Oh how fun! I adore those... thanks for sharing such a funky find! these are so beautiful. have you made them yet? No time yet, but it's on my list! Love these! 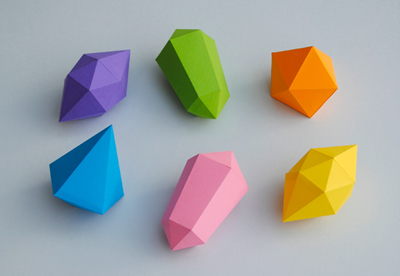 I could see them in iridescent paper...love origami ornaments! Wow cute! :D I love paper!